Piano practice is a finicky little beast. A teacher can do everything right, mess up one small detail, and an entire week of practice is doomed. It’s like cooking pancakes with baking soda instead of baking powder. You can beat the eggs to perfection, add in chocolate chips and blueberries, and pour the batter into little cartoon character shapes but if that darned baking soda makes it into the mix, instead of flipping pancakes, you’ll have a massive flop. So the questions is, are you accidentally adding in the “hypothetical baking soda” before your piano students even leave your studio? For many piano teachers, myself included, the baking soda in the practice pancakes may be that lesson assignment sheet you’ve been sending home with your piano students. Because most lesson assignment sheets are made for teachers, not for piano students. Aside from the fact that they are often boring, the most dangerous part of the lesson assignment sheet is that the teacher, not the piano student, is the one who completes the entire thing! Which is not what we should be doing if we want self-motivated practicers. Self-motivation begins when piano students take ownership of their piano practice. And yet, the very first piece of the piano practice puzzle, the lesson assignment sheet, has generally been completed by the teacher. Of course it should be the piano students who have a hand in completing the lesson assignment sheets! They are the ones taking piano lessons. They are the ones who will be practicing at home. They are the ones who should be committing to memory what it is they need to work on! The very act of writing their own notes begins the process of taking ownership over their own learning and of committing to memory that which needs to be completed. From now on I will be completing any sections on a lesson assignment sheet that pertain to pieces, scales, and exercises to be completed. I will also be completing notes to parents and studio reminders. This week I must remember to (student fills in a reminder). The most challenging part of my piano piece this week is (student fills in a challenge). Andrea will be amazed next week when she hears me (student fills in a goal). Bonus benefit? Using lesson assignment sheets in this way forces you and your students to have an engaged discussions that lead to very short, specific, and precise goals – something that also really benefits home practice progress! 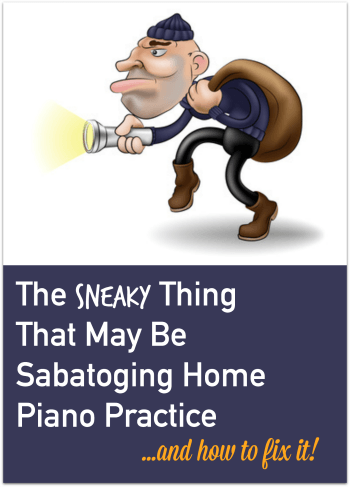 And for all those teachers who use Shhhh… My Piano Teacher Thinks This Is Practice, don’t forget to add a special section to that lesson assignment sheet where your students can track their progress through 88 days of piano practice that are absolutely, positively, most definitely NOT BORING!